Continuing with the theme of DIY and home distillation, this is my latest easy-to-make distillation unit showcasing today’s distillation of Frankincense Dalzielii from Nigeria. A gorgeous looking resin that yielded a superb essential oil. It is important to note that this distillation yields 3 valuable products. A hydrosol that can be used on its own or incorporated in the water phase of cosmetic cremes. A pure resin extract which is a perfect base for medicated oils salves, (moustache waxes), and the oil phase of cremes. This part contains all the resin acids of Frankincense including the Boswellic acids which studies show are anti-inflammatory and anti-cancer in the laboratory. 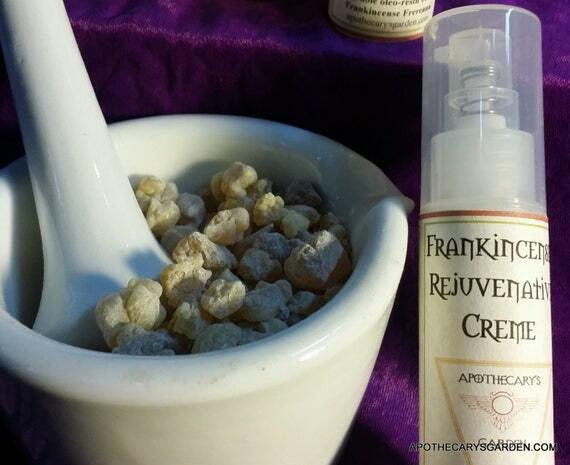 If you don’t have a distillation unit and want to utilize the medicinal properties of Frankincense in cremes, oils and salves, you will find easy instructions for working with the fresh resin here. And here are instructions for making your own resin extract without the need for distillation. A distillation of Frankincense Dalzielii from Nigeria. 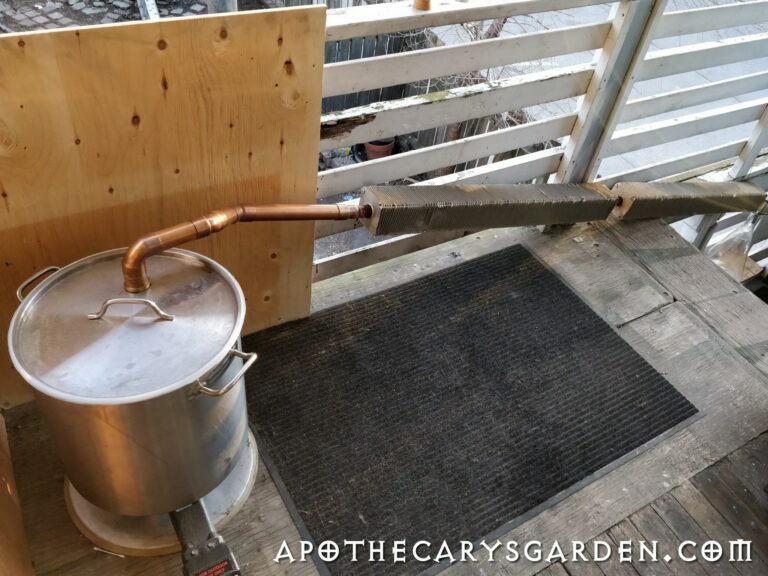 A home-made pot still with an air-cooled condenser. The distillation is performed with a 70-litre high-end kitchen pot, 40-litres of water, 4 Kilograms of fresh Frankincense Dalzielii and an air-cooled condenser. Thick high-quality stainless steel, a particularly thick bottom and a snug fitting lid are what differentiate it from a low-quality pot and make it worth the extra couple of hundred dollars. The gasket I used is taken from a much smaller diameter pressure cooker. I trimmed 1/8 ” off the spine which allowed it to easily stretch around a much larger circumference. The pipes leading from the lid to the condenser are 1 1/2 inch copper plumbing pipes. The nut used to affix the copper pipe to the lid is from a standard North American bathtub drain assembly. Only the first 2 sections are soldered, the rest are hand fitted. Pressure=higher temperatures and I believe the quality of the essential oil is degraded when the temperature goes above 100 degrees Centigrade. I think it is a magical number in nature and more important in Apothecary/distillation work than we realize. 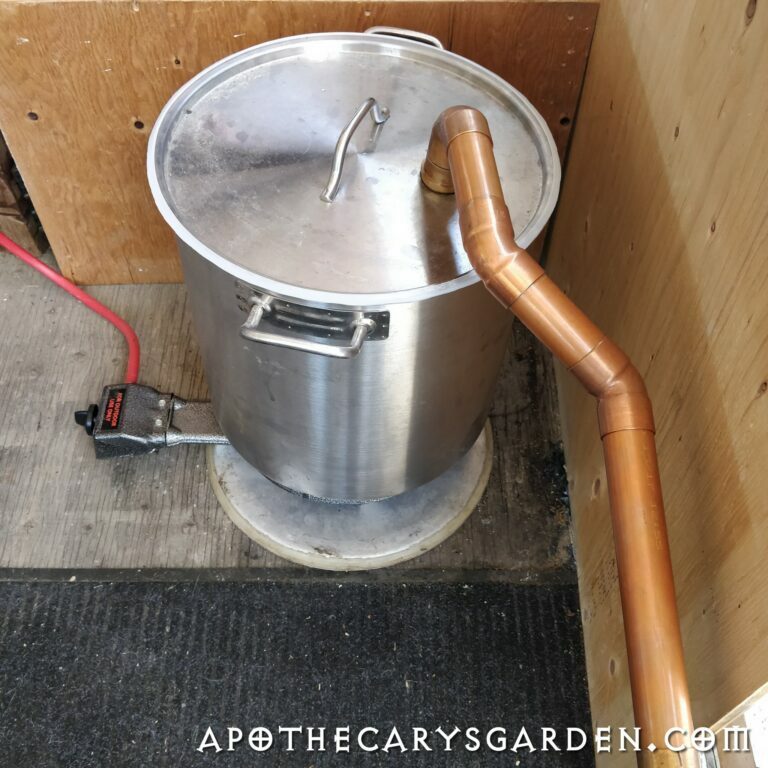 No pressure means there was no need for a clamping system to seal the lid to the pot. The weight of the condenser assembly was more than enough to keep all the vapours in the system. Most of the external copper joints were sufficiently sealed with only a twist and a push. Without pressure, steam and volatiles were gently conducted to the condenser. Not forced. I have been very fortunate to find spectacular materials like this Boswellia Dalzielii to work with. There is no doubt that the high quality of the material contributes directly to the brilliance of the essential oil. The locals use it as chewing gum and as incense. Though I can’t find much on traditional uses of the resin, there is extensive research on the medicinal value of the tree’s bark and roots. Frankincense Dalzielii has the expected Frankincense oleo-gum-resin composition and likely contains the Boswellic and other resin acids in proportions similar to B. Sacra and B. Carterii. 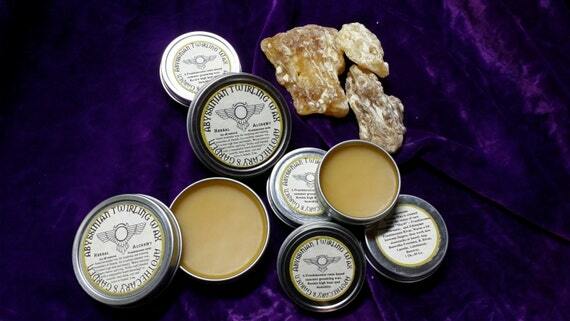 Both the fresh and the spent resin are perfect for use in incense, oils, salves, tinctures and cremes. It bears an eerie resemblance to the Royal Hojari Frankincense of Oman but distinguishes itself from the Hojari with a trademark fragrance of Orange/Citrus and Mint with earthy undertones. The essential oil and hydrosol are gorgeous. Field distillation in resource-poor and remote areas. A decade or so ago I found 4-foot long 1-inch aluminum finned copper pipes in a surplus shop. I could only afford 2 at the time and have gotten a lot of use out of them. They have taken a beating over the years but still work like a charm. Though the condenser is unique and requires a bit of scrounging or googling to find, anyone can acquire one or two of these air-cooled units which create an elegant and economical solution, especially in cooler climates. This type of heat dispersion unit is used in HVAC heating and cooling systems and could be an important element in the design of distillation units for remote, hot, and resource-poor areas where many of our aromatic resins grow. Places where water, electricity and gas are difficult to come by. Designing a passive field distillation unit has been on my mind for over a decade. The distillation/condensing systems we use in the West are not only resource hungry, needing huge amounts of electricity/gas and water which are not available in the bushland and mountains of Africa and Arabia, but they are technologically sophisticated and require specialized parts and repairs that make them impractical in these remote areas. What we need is a hardy, simple still design that utilizes the resources that are abundant in these areas. heat, sunshine and air. Something that can be operated independently by anyone with some basic training, easily repaired with a minimum of tools and technical know-how, will produce essential oils of a consistent quality and ultimately benefit the communities that steward these trees and collect their resin for us. 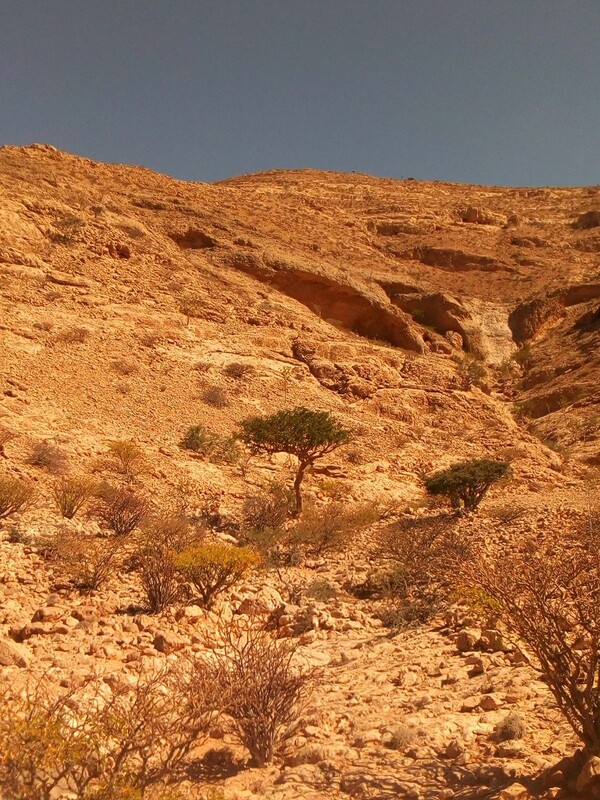 Boswellia Carterii trees in the mountains of Somalia. Water and fuel are scarce. If, (as is the case), all the processing of these natural resources takes place in other and richer countries, little of the monetary benefits reach these communities and countries. Easy to build, easy to repair, easy to operate and clean, sturdy and durable. With a little basic training, remote communities could operate these stills and raise the bar on ethics, quality, sustainability and fair trade in the industry. The demand for Frankincense essential oil is growing by the day while in many areas the Frankincense trees are in sharp decline and estimates indicate we will lose them within the next 50 years. Now is the time to address these issues, to acknowledge and empower those who are best positioned to steward these precious resources. We have developed a nasty self-serving approach to the resources of the world and those of poorer countries. Not only do the communities in these countries not share in our Western abundance, the resources we take from them are dwindling due to our shortsightedness and unwillingness to think beyond the immediate profit margin. I think its time for a change. Before it’s too late. 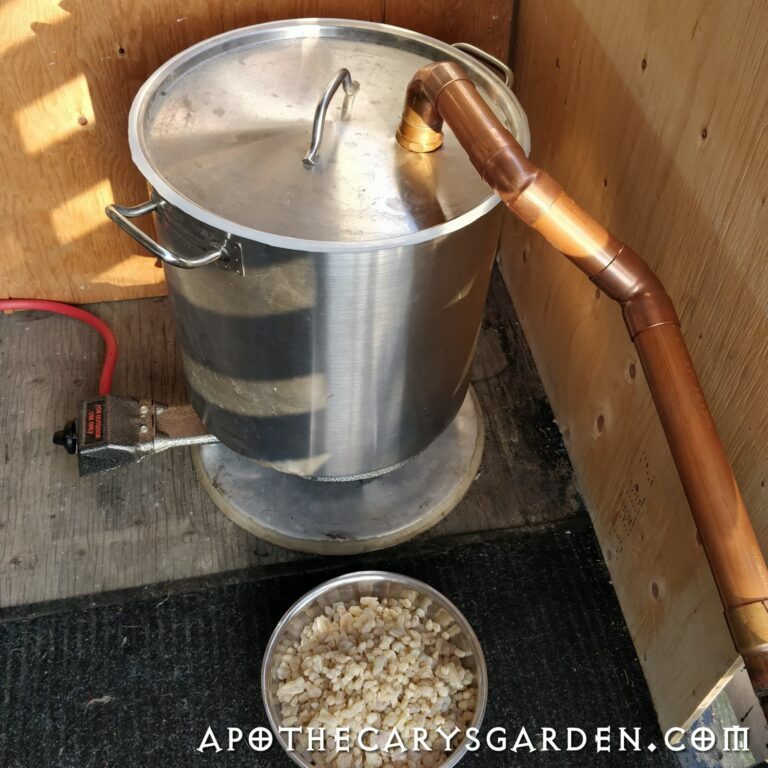 For more information on building your own essential oil still see my posts in the Distillation drop-down menu on http://apothecarysgarden.com or use the following links. How to build a kitchen still for essential oils. Instructions for building the Magical Couscousiere distiller. 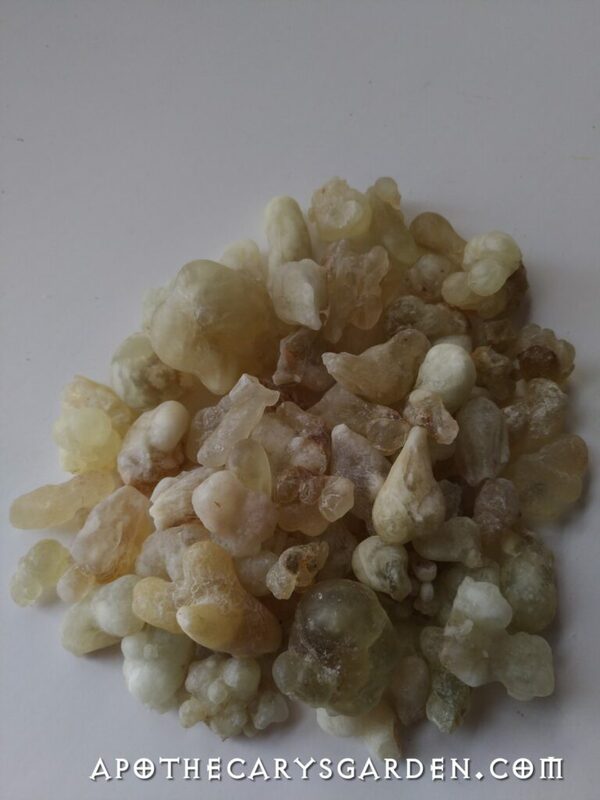 If you have any information on the traditional uses of Boswellia Dalzielii resin in Western Africa or want to contribute in some way to the design/creation of a novel new field still for Frankincense harvesters, leave me a comment below. I would love to hear from you.